You'll love the elegance of this Futura Leather Chair. 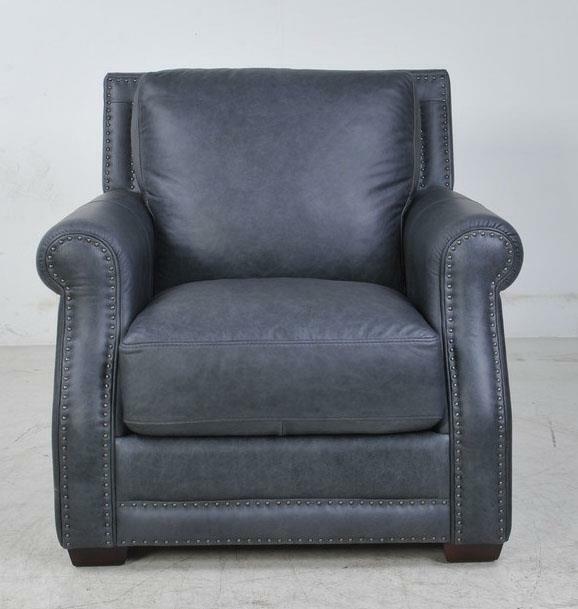 The charcoal grey leather appearance is modern, and is sure to complement most surrounding furniture. This chair has a superior look and feel that is easy to notice and appreciate. This leather chair has classic features, like rolled arms and a nail-head trim, which create a subtle elegance. The slightly tapered wood feet accent the design. With a frame made of strong wood, this chair is sure to be durable through many years of use. Pair with the matching ottoman for supreme comfort. The Fusion Charcoal Leather Chair by Futura Leather at Great American Home Store in the Memphis, TN, Southaven, MS area. Product availability may vary. Contact us for the most current availability on this product. With its distinctive blend of luxurious leather and traditional design elements, the 10030 Fusion Charcoal Leather collection ensures a timeless and classic look that you'll love for years to come. Beautifully-shaped seat backs characterize each sofa, love seat, chair & ottoman. Padded back cushions, also wrapped in leather bring plush comfort to the sofa, love seat and chair seat backs. Rolled arms frame either end with classic style. Rich leather wraps each piece and is accented with nail heads for a tailored finish. The Fusion collection is a great option if you are looking for Casual furniture in the Memphis, TN, Southaven, MS area. Browse other items in the Fusion collection from Great American Home Store in the Memphis, TN, Southaven, MS area.